Square is a free point-of-sale (POS) app that uses a credit card reader and your phone or tablet to process payments. POS is the tool retailers use at the point of purchase to process and manage sales. Square POS includes features like inventory management, customer directories, and sales reports to help retailers manage their business. Square’s free POS tools and affordable card processing rates are a great value for small businesses. With Square, businesses can sign up and start selling in minutes without any applications, contracts, startup, or monthly fees. To use Square, sign up for a free account on their website, then download the app on a tablet or smartphone, connect a card reader, and start selling. Create your free account today. Square is a free app that you download on your iOS or Android device, which, along with a mobile credit card reader or virtual terminal, allows you to accept credit cards from customers. When you create your Square account, you will connect your bank information so that funds from credit card payments get deposited within a few business days. 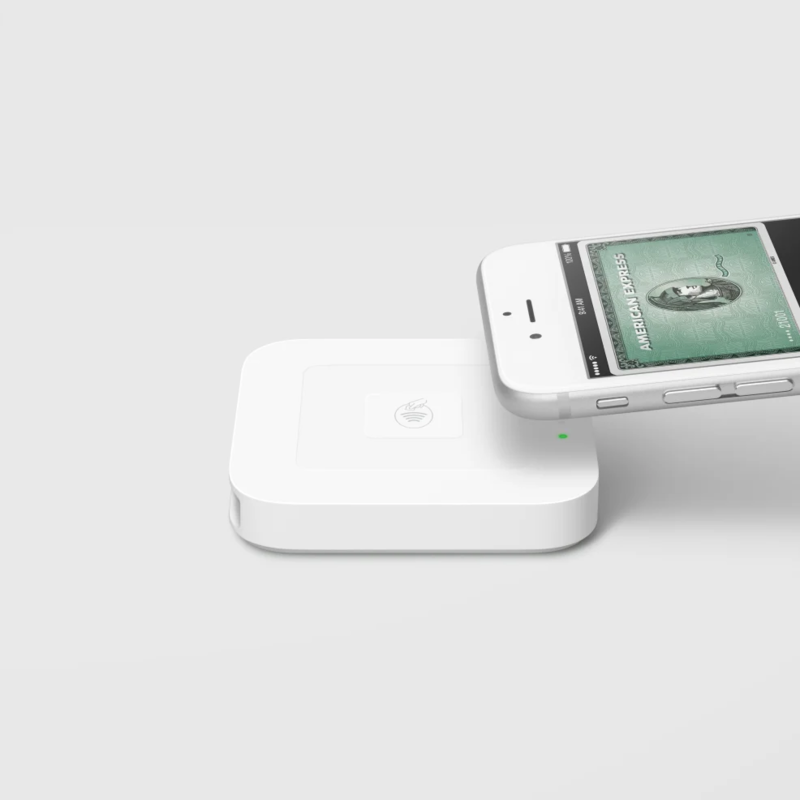 To actually accept payments with your phone, you use one of Square’s card readers. When you sign up for Square, you receive a free magstripe card reader in the mail that plugs right into your headphone or Lightning charger port. There are also chip and contactless payment readers available that connect via Bluetooth. Contactless payments are eWallet payments like Apple Pay, Google Pay, and Samsung Pay that allow shoppers to pay with their phone using stored card or bank data. Square POS app and Square Payments have no monthly fee, startup fee, minimum transaction requirements, or application. Just a flat 2.75% transaction fee. The Square app comes with free inventory management, a customer directory, sales reports, and analytics. Businesses can download Square for free on an Android or Apple tablet or smartphone. Square also comes with a free card reader. 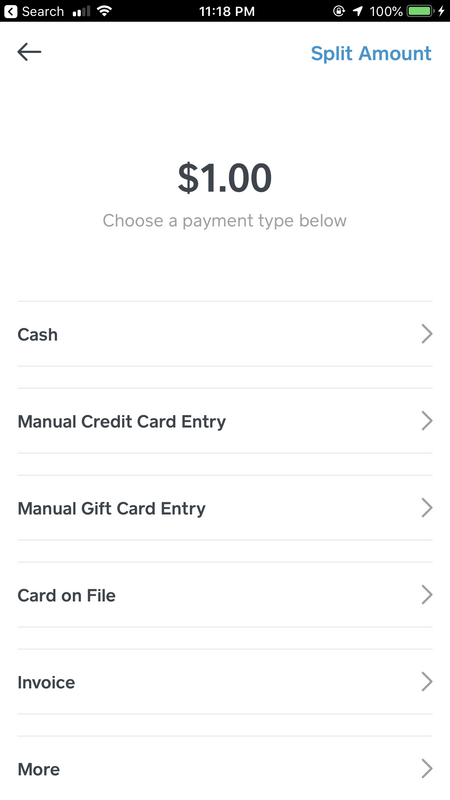 There are no monthly fees or minimums to use Square’s base app and credit card processing, so Square is a cost-effective option for small and startup businesses. Square offers the app and business management tools for free because they make money by charging businesses flat-rate transaction processing fees. Square Payments and Square POS have the basic functions you need to manage your business in-store or on the go with a mobile app. Square is the undisputed industry leader for mobile POS (mPOS) systems, and the app is robust enough to rival some more costly competitors. When it comes to free POS apps, Square is one of the best on the market. There are a few other feature-rich, free POS apps available, but they typically don’t offer built-in or even integrated payment processing. Square offers just about everything a new or small retail business would need in a tidy package at a great value. Square is best for small and startup businesses that are either just starting out or process under $10,000 to $20,000 per month in sales. Their payment processing is one of the most affordable options for businesses with an average transaction less than $20. Once your business regularly processes over $10,000 per month and your average sale is above $20, that’s the point you are likely outgrowing Square, and can find a more affordable credit card processing provider. Cafes and coffee shops: Square’s payment processing rates are very low for any business that has an average sale under $20. Startup businesses: Square has no minimum processing requirements or upfront costs; if you don’t make any sales, you don’t have to pay anything. Food trucks: Square can process credit cards offline, so it’s a great fit for businesses that travel around. Market vendors: Offline sales capabilities and no minimum transaction requirements or monthly fees make Square a great option for people who sell at flea markets or the occasional craft fair. Sole proprietors: Square allows massage therapists, hair stylists, makeup artists, handymen, and other individuals an easy option for accepting card payments on the spot. If you’re asking yourself, “How does Square work?” the first step in using Square to manage your business and process payments is actually setting up a Square account. The process is very fast, and once you complete each step, you can start setting up your store and selling right away—there is no waiting to be approved. Plus, any information that you enter at signup can be changed later on, so don’t sweat the details. 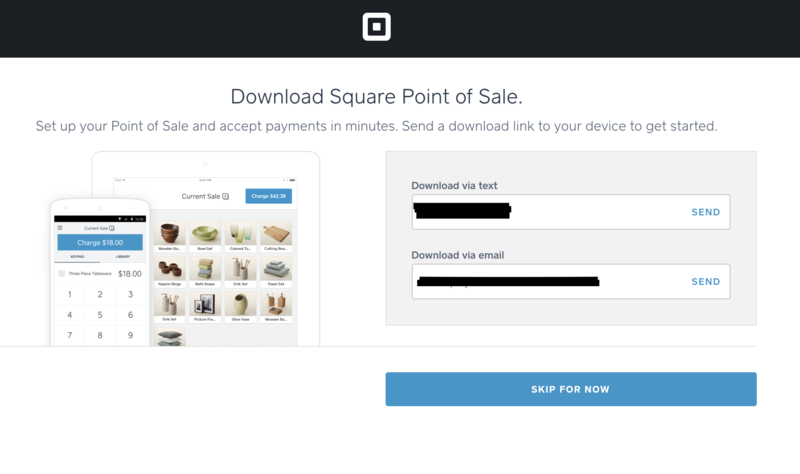 If you already have a Square account, skip down to How to Use Square to Make a Sale. Visit Square’s website and click “Get Started.” Then the below screen will appear. Enter your email address, create a password, and select your country. Then continue on to the next step. Tip: Be sure to choose a secure password with numbers and symbols because you will also need to enter your banking information and Social Security number. 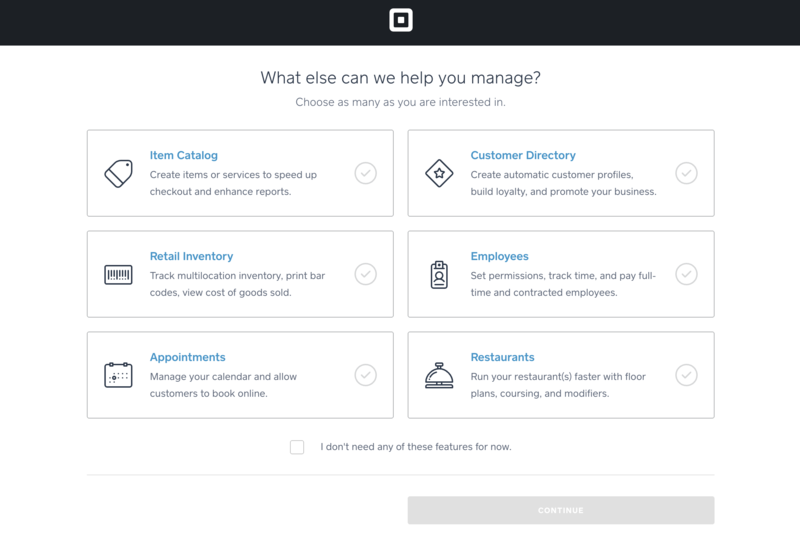 On the second screen, you will need to select whether you are using Square as an individual or a business. If you select business, it will prompt you to type in your business name. If you select individual, you will have to type in the name you would like to appear on your receipts. In most cases, you should choose “Business.” However, the selection is not critical and can be changed later on. 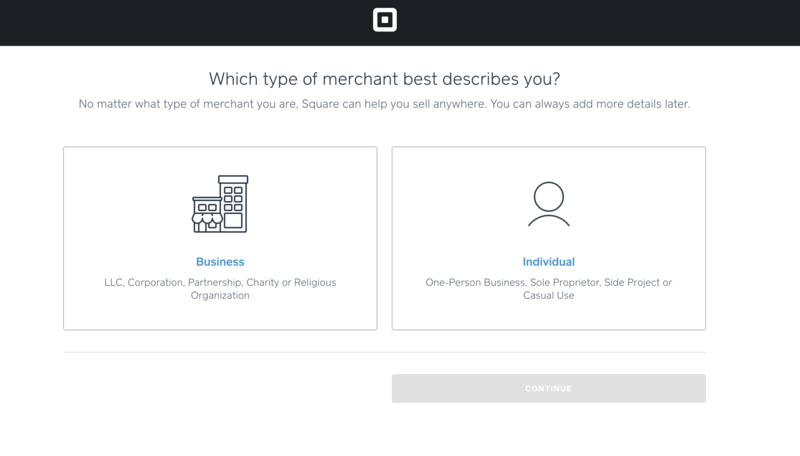 Next, select whether you are using Square as a business or individual. 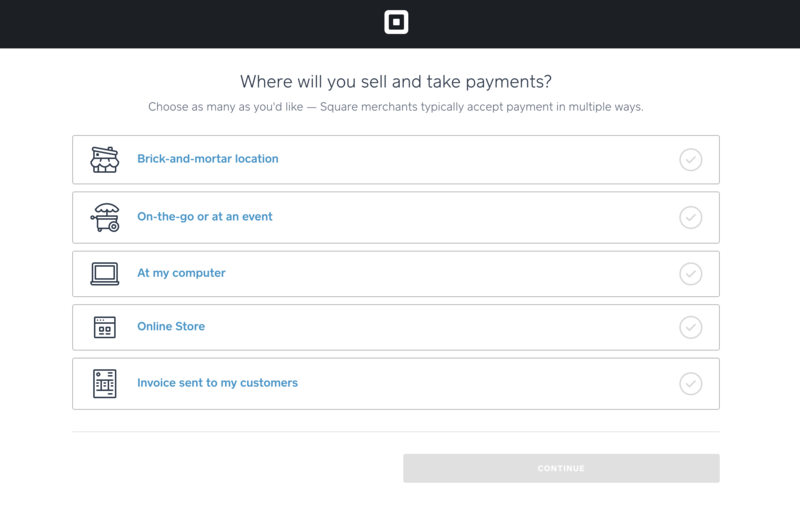 On the following screen, Square will prompt you to select where you will sell products or accept payments. You can choose multiple options and update your preferences later on. Invoices and online payments have higher transaction fees than brick-and-mortar or on-the-go payments. 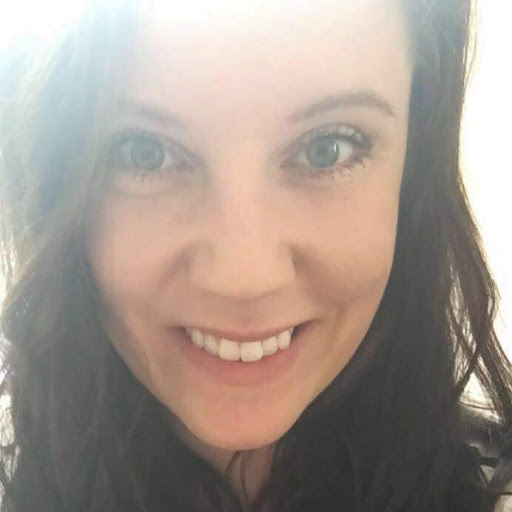 However, none of the payment options has monthly fees or minimums, so no matter what you select, you are not locking yourself into any type of payment. Tip: If you choose to sell via an “Online Store” and do not already have a website, you can create one through Square and Weebly for as little as $8 per month. Square lets businesses sell products and collect payments through multiple channels. On this screen, you can select from a variety of extra features that come with a monthly fee ranging from $5 to $60 per month. If you are looking to use Square mainly as a payment processing system, you probably do not need these paid features. However, if you are using Square as your main POS system, consider investing in Square Retail or Square Restaurant for additional business management tools. Tip: If you have multiple employees, Square offers affordable payroll processing, including direct deposit and tax reporting, that can save a lot of time. Square has extra features businesses can add to their POS for a monthly fee. After choosing any optional features to add on to your Square POS, Square will ask you to choose your business type and estimated revenue range. You can enter your Employer Identification Number (EIN) at this stage if you have one. Again, this can always be updated later. Tip: If you are an established business with medium-high annual revenue, you may be able to negotiate lower processing rates. 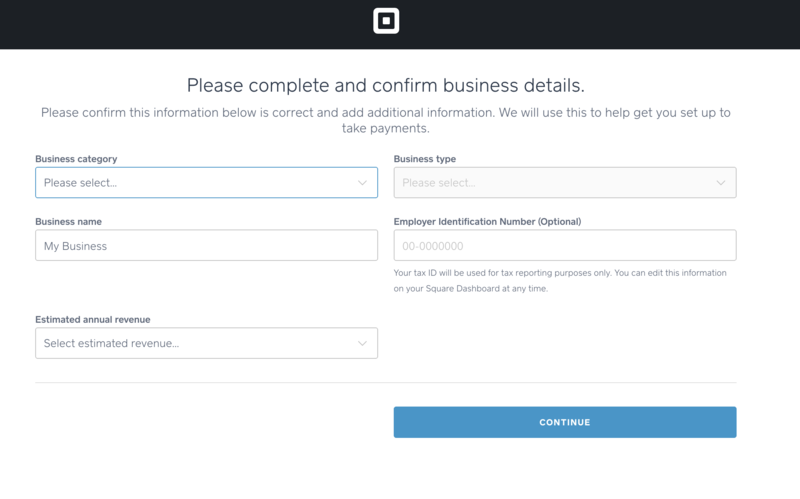 When signing up for Square, businesses can enter their Employee Identification Number. In order to sign up for a free Square account, you need to provide your name, address, birthday, phone number, and Social Security number. Square uses this information to confirm your identity. Many merchant services providers perform credit checks before approving your account. Square, however, does not. 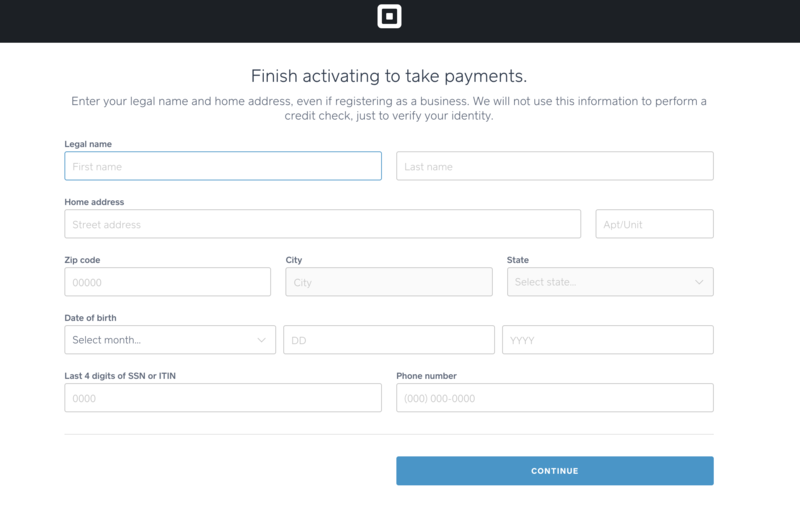 Square does not perform a credit check, but does confirm your identity before activating your free account. 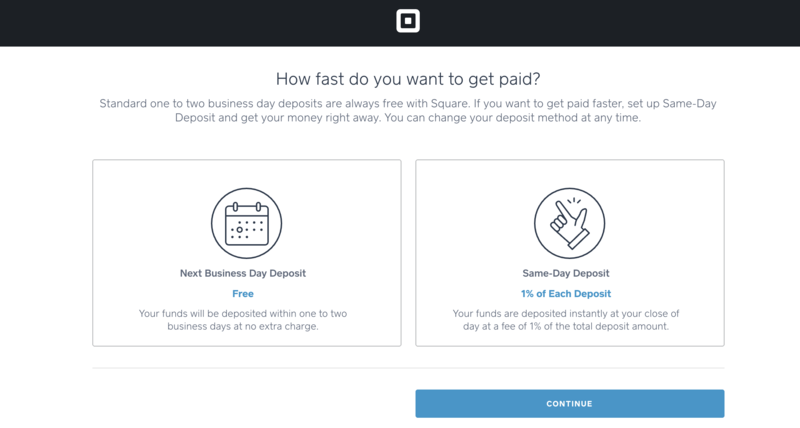 Square offers free next-day deposits for all businesses. In reality, funds are generally available within one to two business days. You can choose to receive your deposits at the end of each business day for an additional 1% fee. We recommend sticking with free next-day deposits, as that is sufficient for most businesses. Tip: If you ever need your deposits right away, you can get them instantly (for the 1% fee) by going to your Square Dashboard, selecting “Deposits,” and pressing the “Deposit Instantly” button. Doing this will not change any of your regular deposit settings. 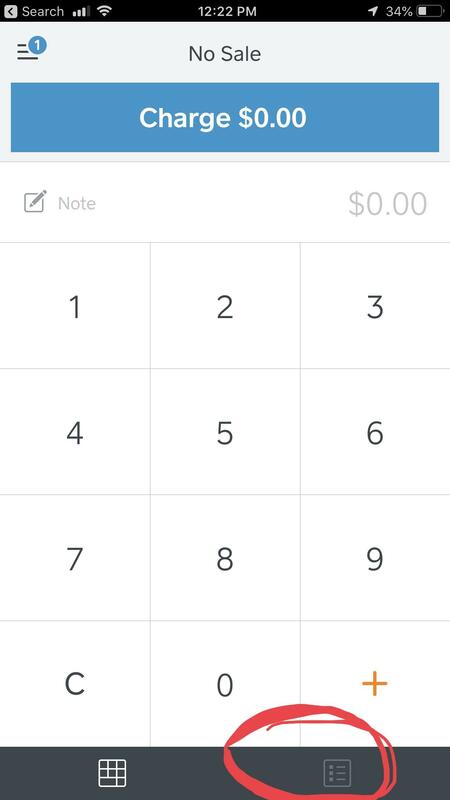 Square has free next-day deposits or instant deposits for a 1% fee. This step is very important. Without a connected bank account, you can’t deposit the revenue you make from sales. Remember, your standard Square account does not have any monthly fees. Unless you sign up for extra features, you will not be charged when you link your bank account, except for a one cent test charge that is immediately refunded. Tip: If you do not have a dedicated business bank account, we highly recommend opening one to separate your personal expenses from your business cash flow. Check out our article on best small business checking accounts for our recommendations. It’s important to link your business bank account with Square so that you can deposit the money you make from sales. Square does a one cent withdrawal and deposit to verify your bank information. All free Square accounts also come with a free magstripe card reader. You can choose between a card reader with an audio jack or a Lightning connector that works with newer iPhone models. You can also choose to purchase a contactless and chip mobile card reader for $49. The reader you select will arrive in the mail. 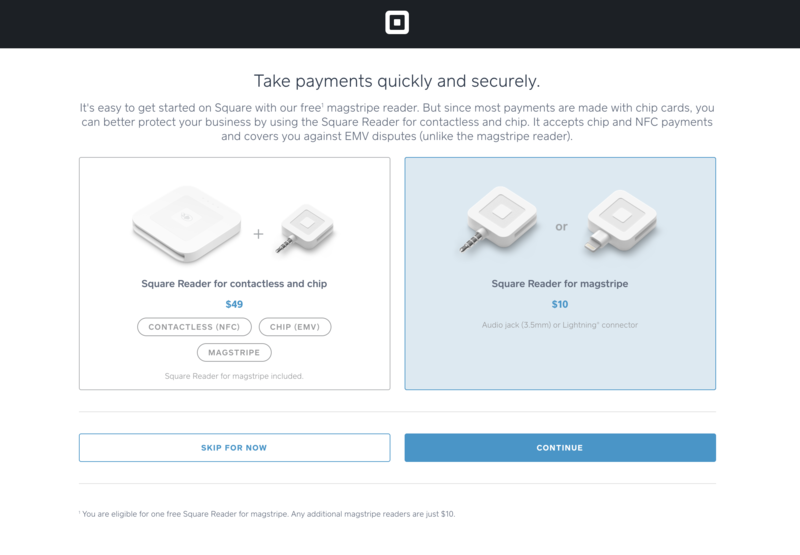 You can purchase additional readers and equipment from Square anytime. Note: This was not my first time signing up for a Square account, which is why Square shows the magstripe reader as $10 instead of free. After receiving one free magstripe card reader, additional readers are $10, even if you sign up with a completely different business. 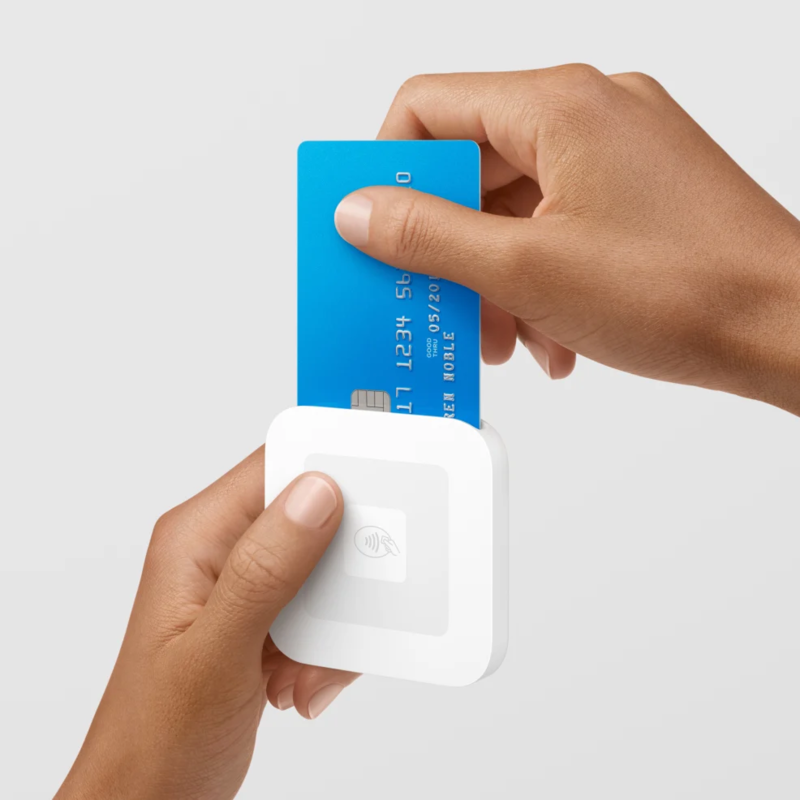 Square offers mobile card readers for swipe, chip, and contactless payments. Your account is now ready to use. Download the Square POS app to start selling on an iPhone, iPad, or Android device. Or, you can continue on to your Square Dashboard to view and change settings, add inventory items, create employee logins, manage customer information, and more. 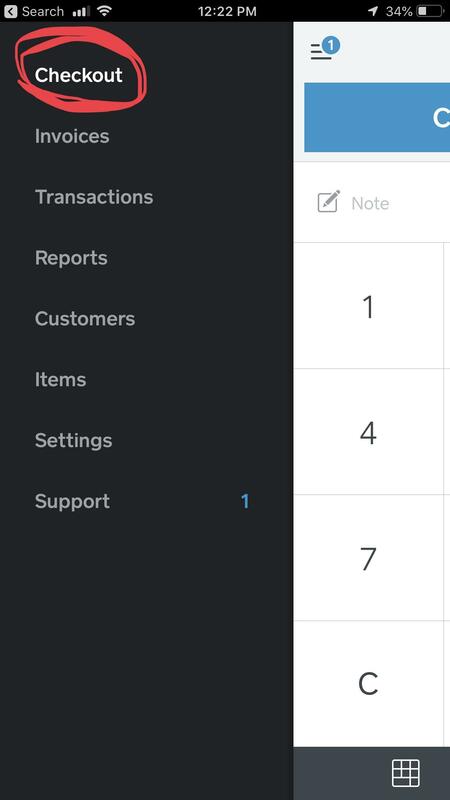 Tip: The information between your Square Dashboard and Square POS app are synced, so any changes you make in one area will appear in the other, including inventory adjustments from sales and changes to customer data. Download the free Square POS app to process payments on Apple or Android devices. Now that you have created a free Square account, you can test out features, adjust settings, and take time familiarizing yourself with the application (we find the navigation very intuitive). You can also test out different paid features. All billing for Square applications and products are month to month, so there are no contracts or cancellation fees. Now that you know how Square works, you probably want to know how to use Square to start selling products. It is very easy to process transactions through Square POS. The steps are the same whether you are on an iPhone, iPad, or Android. Before processing your first sale, take a moment to configure the store settings on your Square dashboard. This will save you time when you have a long line of customers because everything you need, such as receipts and customer information, will already be stored in your account. To get the settings part of your dashboard, sign in and navigate to “Account & Settings” in the left tab. Add inventory items: If you are selling physical products, we highly recommend taking full advantage of Square’s inventory management features; add your products including quantities, photos, and pricing. Change personal and business information: Such as address or phone number. Bank accounts: Set or change the bank account that your money is deposited into. Locations: Add a new physical location for your business if you operate multiple storefronts. 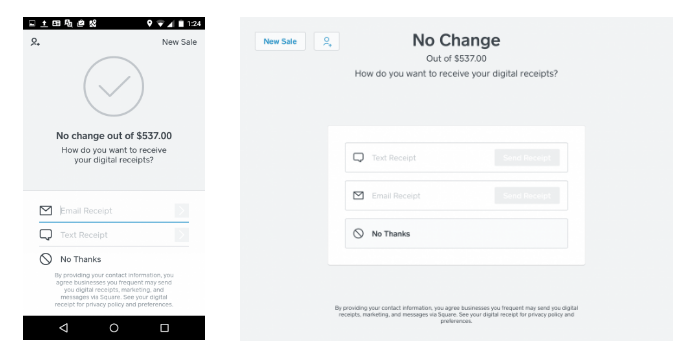 Pricing and subscriptions: See how much Square charges you for different types of transactions and services, such as Square Appointments (free for one user) and Square Loyalty ($25 per location, per month). Both are ideal tools for gyms, salons, and other service businesses. Deposits: See how quickly your money gets deposited; for an additional 1% of the balance, you can set up Instant deposits. Receipt: Customize the text, logo, and colors on the receipt your customers receive. Tax forms: Set up your taxpayer information and 1099-Ks (a 1099-K is a tax form that online sellers use to report revenue from credit card sales). Devices: If you use multiple devices to accept payments, you can create codes to quickly sign in on any device without having to type in your username and password each time. Square accessories: Purchase additional card readers, a tablet stand, and other hardware. When you’re ready to make a sale, select “Checkout” at the top of the left-hand menu. Then you can either enter a dollar amount or select the list icon at the bottom of the screen to ring up one of the preset inventory items you created. We recommend using this method if you have physical products with inventory to track. To process a transaction, go to “Checkout” and then enter a dollar amount or select an inventory item. Once you have the transaction amount or appropriate products entered, simply click the “Charge” button, which will take you to the payment screen. At this point, you can also apply loyalty rewards or discounts. There are multiple payment options to choose from. If you have a connected card reader, you can go ahead and swipe the payment card. You can also type in a card number, a gift card number, send an invoice, use a credit card stored on file, or accept cash or check. 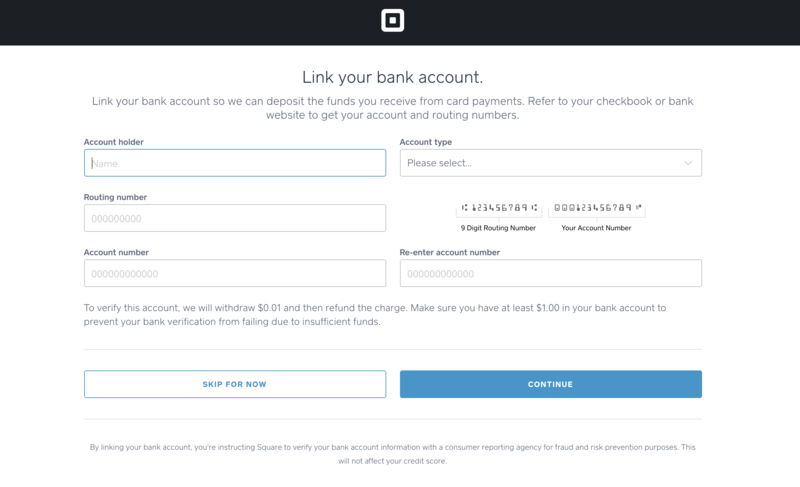 Square offers multiple payment methods. Once you have completed the payment, Square gives your customer the option of what kind of receipt they would like. You can send an email or text receipt or simply select “No Thanks” if your customer doesn’t need a receipt. The system will store their email or number so that they don’t have to provide it every time they pay a vendor that uses Square POS. Square offers digital text and email receipts. Square has a lot of great features that make Square POS and Square Payments the best options for many small businesses. However, Square is not right for everyone. Carefully read through the pros and cons to decide if Square has the features that are most important for your business. Square POS and Square Payments have a lot of benefits that make it a great choice for many small businesses. Square is very easy to set up, intuitive to navigate, and has one of the most robust mPOS apps available for small businesses. Even though Square is a top-rated free POS app and payment processing solution, it’s not without flaws. There are also certain types of businesses Square is not suited for. If you have lots of products, multiple store locations, you primarily sell online, have a business with a high sales volume and high average transaction, or if you have a full-service restaurant, you may want to look into Square alternatives. Luckily, there are plenty to choose from. 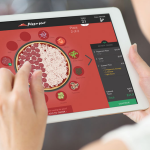 Lightspeed is a cloud-based POS system designed for traditional brick-and-mortar retailers. Lightspeed has a very sophisticated inventory management system and unparalleled custom report builders, plus over 40 built-in reports including employee performance reports to identify top sales staff, view average transaction value, and properly prepare for rush hours. However, Lightspeed does not have built-in payment processing. At $99 per month, Lightspeed is definitely pricier than Square, but the features are well worth the price tag for businesses that need to manage large inventories or want to streamline operations to boost revenue. Overall, Lightspeed is a great option for growing storefronts. Visit Lightspeed to get started with a free demo. Shopify is point-of-sale solution and an ecommerce platform. Like Square, Shopify also has built-in payment processing. Unlike Square, which focuses on mobile and in-person sales, Shopify is ecommerce-based. Overall, Shopify POS is the best solution for retailers with ecommerce. Shopify has three pricing tiers, each with a monthly fee. Shopify also offers flat-rate payment processing that is similar to Square’s. Overall, Shopify is a great alternative for ecommerce businesses while also providing the option of processing in-person sales. Visit Shopify for a free 14-day trial. PayPal (and the mobile app PayPal Here) is one of the closest direct alternatives to Square’s mobile POS and Square Payments. PayPal offers competitive flat-rate processing similar to Square, except PayPal can, of course, accept PayPal payments. PayPal’s mobile app has decent features, but it is not as robust as Square’s. PayPal is a good alternative to Square for low-cost, flat-rate mobile credit card processing. PayPal is also a good payment processing solution for most businesses, as long as you are not looking for a solution that offers both payment processing and POS. Visit PayPal to sign up for a free account. Square is straightforward to setup and use. However, there are a lot of details to consider when choosing a payment processor or mobile POS. We put together a quick list of some of the common questions and concerns about Square. Are there any questions we missed? Not finding the answer you’re looking for? Ask them in our Fit Small Business forum. Yes. The base version of Square is free to use. It’s free to create an account and to download and use the POS app. You only pay for transaction processing whenever you make a sale. How long does it take for Square to process? Square processes transactions immediately. Then funds are available in your account within one to two business days. You can also pay an additional 1% fee to receive deposits immediately. How does Square deposit money? When you first sign up for Square, you attach a checking account. Your money from sales will be deposited to this account regularly. You can update your banking information anytime under “Settings” in the Square Dashboard. How do I set up my Square card reader? If you are using a free magstripe reader, all you need to do is plug it into your smartphone or tablet. If you are using a wireless Bluetooth reader, first press the button on the reader to turn it on. Then go to your smartphone or tablet and turn on Bluetooth. Next open the Square app and select “Connect a Reader” under “Settings.” Finally, put your card reader into pairing mode by pressing the reader’s power button for a few seconds. As soon as you see flashing orange lights, the wireless reader is paired and ready to use. How do I take a payment with Square? To make a sale with Square, open the Square POS mobile app, enter a dollar amount or choose one of your preset products. Then press “Charge” and select a payment method. Can you use Square for personal use? Yes, you can use Square for personal use. If you are running a business as a sole proprietor, there’s an option to set up your account as an “Individual” type for these kinds of merchants. However, if you are looking for an app to charge or pay personal expenses between friends, Square has a Cash App that is better suited for non-business personal payment transactions. Square is a free mobile POS and payment processing app that works on smartphones and tablets. Square makes money by charging flat-rate payment processing fees. In return, businesses receive a suite of free management features, a mobile POS, and competitive credit card processing rates. 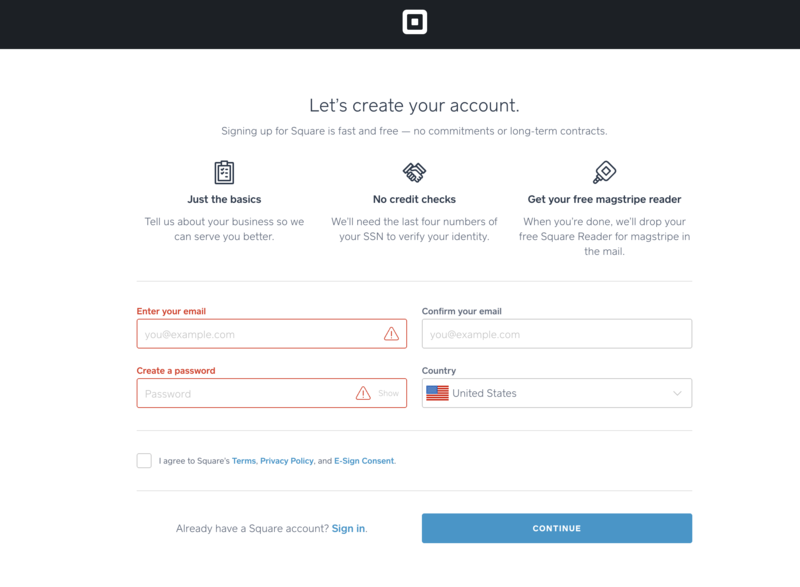 It’s easy to set up a free Square account in just a few steps. Processing mobile sales is even easier. Best of all, Square is free to use and requires no commitment. Visit Square to set up your own account and test out the app for yourself. I am having trouble accepting debit. What am I doing wrong? Also the reader will not read credit cards and I have to put the numbers in costing me more money. Do I have a faulty reader or is this a built in problem? I’ve not run into either problem, so it might be your reader. Are you using the free reader or the $49 contactless reader? If you’re using the free reader and process several cards per day, I’d go ahead and buy the $49 reader since it’s far more secure to begin with. That might fix your problem altogether. Or, if your reader was working and now it’s not, it might be time for a replacement. Either way, you can call Square since you have an account with them and see what they have to say. That would be my first move. I hope this helps, good luck! I run a not for profit resale shop and use the square. I frequently have customers who use credit or debt cards and want to add a donation to the purchase. They will say add a $20 donation. How can I do that? That is a great problem to have! 🙂 You can create a custom item each time and add the donation amount to the sale on the fly. However, perhaps the better way is to create “Donation” items for set amounts — say $5, $10, $15, $20 and so on — in your Square item list. You can set these “Donation items” up as non-taxable items, too, so if you collect tax on resale items, the Donation amount won’t be taxed. You can also track the income from these specific “Donation” items for your bookkeeping. I think this is the best way to handle this in Square. I hope this helps, good luck! How can I get different sales tax rates to apply based on the address entered in the cart on my online store? Currently, Square’s free online store only adds sales tax just within the state or states you do business. 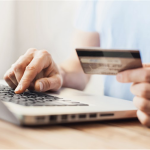 If you want more control over taxes in other locations, then you need to switch to a more robust ecommerce solution with complete tax controls. Both WooCommerce on WordPress and Shopify integrate well with Square POS for both payments and inventory management and will give you more sales tax options. I hope this answers our question, good luck! We are a food truck; how do I set up different sales tax rates based on the location I will be in that day? eg) Day 1 in County A with a 4% sales tax; Day 2 in county B with a 5% sales tax. You can create multiple tax rates within your Create Tax menu in your Square dashboard on the computer or from your Square POS app on your mobile device. When you make a sale, you can select the rate that matches the area you’re selling in. Here are the sales tax setting instructions in Square. Hope this answers your question! Does Square have any fraud protection or insurance? Yes, Square does offer $250 per month in chargeback protection. That’s cumulative each month and they don’t cover anything over $250 within a month, plus it doesn’t cover a single chargeback over $250. But if you’re not a high-risk or high-ticket seller, it’s a good built-in deal. We explore Square’s coverage, plus other chargeback protection options in detail, in our chargeback protection buyers’ guide. Hope this answers your question, good luck!